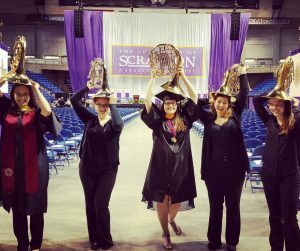 Samantha Schuster ’19, second from right, is a member of Performance Music at Scranton who plays the French horn. Q: When and why did your passion for music begin? A: I’ve always had a passion for music. My family is very musical, so I’ve grown up around playing and performing. I started piano lessons when I was 6 and have since learned how to play over additional 10 instruments. Q: What made you want to join the band? A: I joined band in 4th grade and have continued to do so ever since. 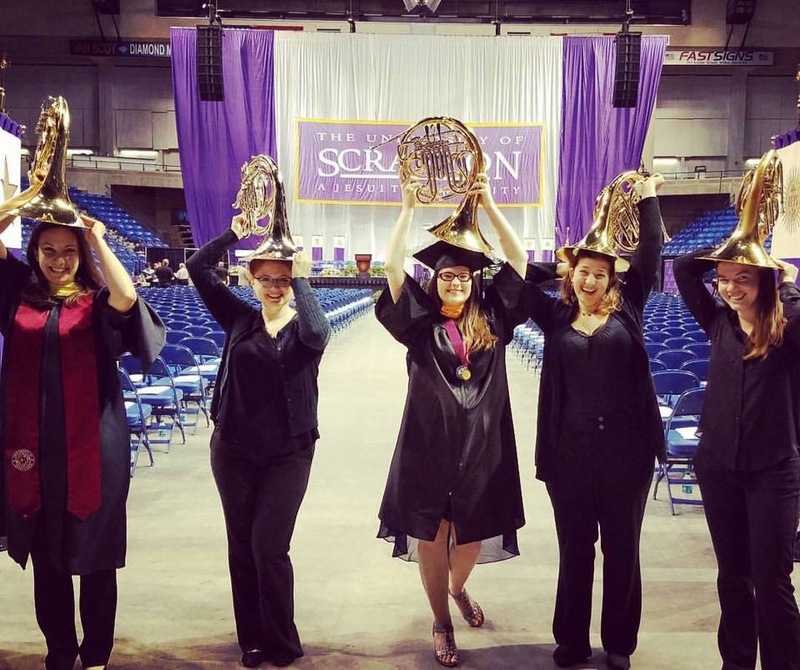 Joining Performance Music at Scranton was just a given for me! I don’t own my own horn, as they are really expensive (a decent one is at least $2,000). I currently use a school horn. I just love playing with an ensemble and making something beautiful that people familiar with band ensembles and those who are not can relate to. Q: What’s your favorite moment as part of the Scranton band? A: My favorite moments as a part of the Scranton band is making jokes with my section. There are only three of us this semester, so we know each other well. We make jokes about when we mess up or about the stuff said by Cheryl Boga, the head of the Performance Music Department. We also celebrate each other’s victories in the songs and are able to laugh about messing up instead of being embarrassed. Being able to joke and enjoy each other’s company during rehearsals helps us to not only play more cohesively as a section but to bond and build stronger relationships with one another. Q: If you could play any other instrument, what would it be and why? A: If I could play any other instrument, it would be the euphonium. Its sound is beautiful and it has nice bass lines with the tuba section. Q: Who is your musical inspiration? A: My musical inspirations are the other people in my section. They are all so talented. I practice and try to sound like them during rehearsals and performances. Q: When is the band’s next performance? A: The band’s next performance is on Nov. 10 at 7:30 p.m.
Q: What is your advice for any student who wants to join the band? A: Join!!! I haven’t met a person I didn’t get along with in the band. 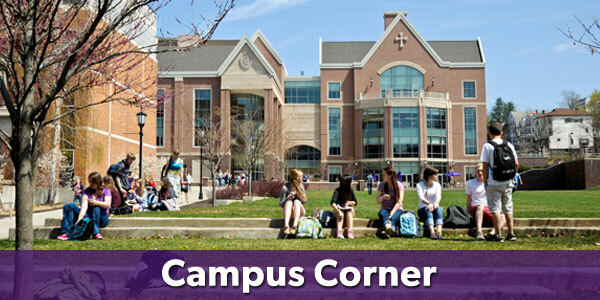 We have everything from students picking up and instrument for the first time to staff and faculty members who have been playing longer than some of the students have been alive. There is no judgment about someone’s talent level. We all just come together to make beautiful music, to expand on our musical skills, and to have a good time. Q: What do you think is the major difference between being in the Scranton band and being in other bands? A: Throughout middle and high school, there would be auditions to get into certain bands, to determine what part you played, and to see how much you’ve been practicing your music and your scales. In Scranton’s band, though, there are no auditions. You agree within your section who is going to play what part, and even after we determine this, moving parts is easy. Auditions were always the worst yet seemingly most important part of the bands I’ve played with, but Scranton’s band takes away the stress and helps me to enjoy performing more. Q: What is the most rewarding part of being in the Scranton band? A: The most rewarding part of being in the Scranton band is knowing that you have worked with dozens of band members to produce the best music possible. Running through songs during rehearsals and hearing the chords, rhythms, and tuning lock in perfectly fills me with a sense of pride. We work hard every week to present our talents in the best way possible. It’s satisfying, in the same way, studying for a test and getting a great grade is: knowing you put in the time and effort and then seeing and hearing the results directly from this work is a satisfying and prideful feeling.